Brodo, Irwin M., Sylvia Duran Sharnoff, Stephen Sharnoff. 2001. Lichens of North America. Yale University Press, New Haven. Hardcover. 795 pgs. Wow! Ten pounds of glossy color photographs and detailed text. This gigantic book is not only for lichen lovers but also for nature photographers and bibliophiles in general. The first 100 pages describe lichen morphology, physiology, taxonomy, habitat etc. 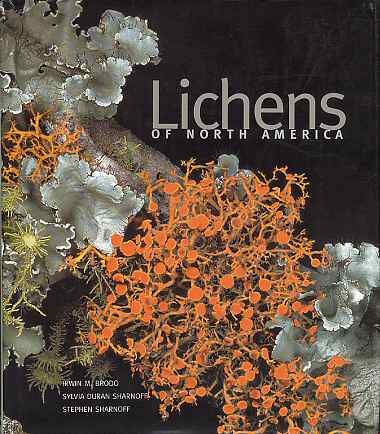 The next 700 pages provide the most beautiful and technically perfect photographs of lichens that one will encounter, not to mention the detailed species keys, descriptions, and distribution maps. If you are a book lover, a lichen afficionado, or a photographer, and you have to choose between eating and buying this book, go hungry.